4channers and other “meme warriors” are battling for France’s far-right presidential candidate. Vladimir Putin isn’t the only one trying to attack the French presidential election. Far-right trolls and meme warriors like the kind who helped elect Donald Trump have found a new calling: “The Battle of France.” There’s no way of telling what real-world impact it’s having, but with the vote just a few days away, activity in support of right-wing candidate Marine Le Pen has reached a fever pitch on Reddit, 4chan/pol/, and other online forums popular with the American alt-right. “All shitposting units are required to man their battle stations,” declared a recent 4chan post. “Meme war recruits: prove your worth. 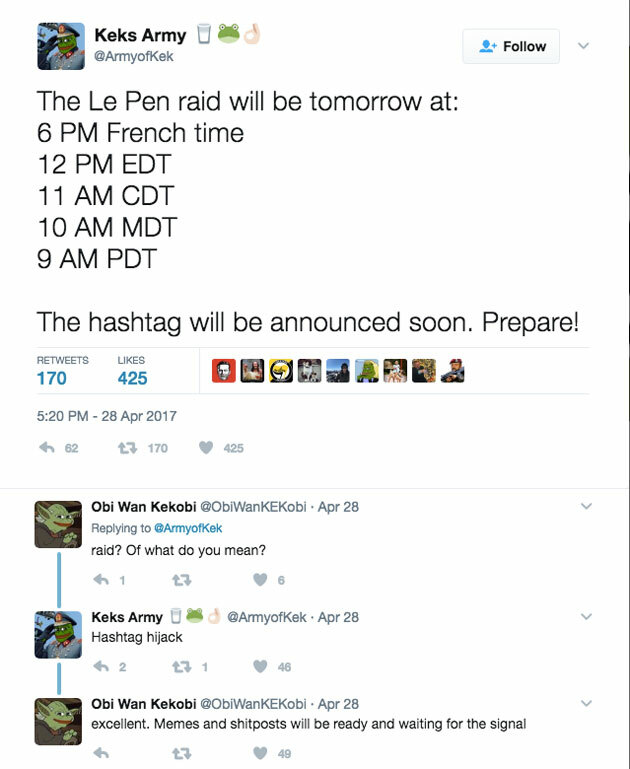 Veterans, lead the charge…MAKE FRANCE GREAT AGAIN.” The post urged 4channers to join a Discord forum dubbed “Operation: Marine Le Kek,” where at any given moment up to about 450 participants are conducting meme “raids” to hype their candidate and attack her centrist rival, Emmanuel Macron. Using fake French identities and sock puppet social-media accounts, they’ve hijacked Twitter hashtags, social-media posts, and comments sections on news sites with memes portraying Macron as a stooge of Jewish financiers who will sell out the working class and capitulate to Muslim terrorists. The meme warriors of 4chan have been careful to conceal their American identities. A number of posts on Discord urge users to adopt French-sounding social-media identities and avoid using Google Translate to convert English phrases into French. Instead, they’ve collaborated with the French equivalent of 4chan and a related French-language forum on Discord called La Taverne des Patriotes. English-speaking visitors to the French site hang out in a sub-forum known as #Foreign_Legion, where they often solicit help in translating their anti-Macron memes into French. Other memes have focused on the age difference between Macron and his older wife. Late last month, 4channers used doctored images to spread the conspiracy theory that he was secretly sleeping with his wife’s 30-year-old daughter.